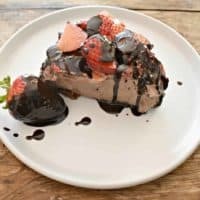 Luscious Keto No Bake Chocolate Strawberry Cheesecake Recipe! This Keto No-Bake Chocolate Strawberry Cheesecake recipe is easy, no-bake, grain-free, sugar-free, and it doesn’t require the use of an oven. Are you ready to be blown away by a luscious keto no-bake chocolate cheesecake recipe? I am so thrilled to be able to share this simple low carb recipe with you. Honestly, this beauty is a keeper. I had loads of fun making and sharing this keto no-bake cheesecake. I knew I had a real gem when those who tested it couldn’t stop raving about it. What I love most about this recipe is that it’s not only a great keto treat but it’s S-U-P-E-R easy to make. Do check out our collection Keto Cream Cheese Recipes for more delicious keto-friendly treats. Do you know what makes a traditional high carb cheesecake a great candidate for a keto transformation? Since cream cheese is the main ingredient in cheesecake and because it’s naturally low in carbs, it makes for an easy recipe to convert to keto. With that in mind, it was time that I not only created another cheesecake recipe for you but a no-bake keto option. Did you catch that this low carb cheesecake is NO BAKE? This leaves no excuses for my no-baking friends not to give it a try. Non-baker this recipe has your name written all over it. I promise that if you can use a mixer, you can make this keto no bake chocolate strawberry cheesecake recipe. We are smack in the middle of summer here in South Florida. So turning on the oven is reserved for only when it’s absolutely necessary. Let’s just say that hubby is happy that I am experimenting with no-bake recipes. AND….he’ll really thank me when the electric bill shows us. Although I am sharing this recipe while it’s sweltering hot over here. Let me be clear, this low carb no-bake chocolate & strawberry cheesecake CAN and SHOULD be enjoyed year round. Besides it being super easy to make, you can opt to leave the strawberries out if they are not in season. Trust me, this keto cheesecake is rich enough to stand all by itself. Don’t get me wrong, strawberries add a great dimension to this keto no-bake chocolate strawberry cheesecake, but if you can’t get your hands on some fresh strawberries it’s not a deal breaker. An added bonus of omitting the strawberries is that it makes it even lower in carbs. So yeah, go ahead and make this keto no-bake cheesecake year round. With that being said, you certainly need to try the recipe exactly as written at least once. Because let’s face it, nothing beats the combo of chocolate and strawberries. These besties were meant to go hand in hand. Except that my recipe is even better. LOL, I know that sounds like a major brag, but hear me out. For one, my recipe is homemade and guess what? Homemade is ALWAYS better in my book. Plus, it uses only REAL ingredients. No need to go googling to find out what on earth all those hard to read ingredients on the package are. OHHHH, and let me remind that my recipe is also low in carb, and keto-friendly! Betcha can’t say that about the other one now can you? Can I hear a collective amen for turning old recipe favorites into healthy options?! This recipe uses both sugar-free cocoa powder and sugar-free baking chocolate. Do you know the one that looks like a chocolate bar but has absolutely no sweetener in it? I remember the first time I used baking chocolate in a recipe, AND how I took a big bite expecting it to taste like a regular chocolate bar. Let’s just say, I was royally disappointed when I realized baking chocolate meant zero sweeteners added. LOL, this girl has sure come a long way since those first baking days many moons ago. Surely I can’t be the only one with a similar story? This recipe also uses baking cocoa powder. Because you know what’s better than chocolate in a recipe? Two forms of chocolate in a recipe! I went with Hershey’s Dark Cocoa Powder because it really does a great job, and you can’t beat the price. But of course, you can also use the Ghirardelli’s cocoa powder if you want to splurge on richer tasting chocolate. Can I share a tip with you? Aim to have your keto baking pantry always properly stocked. 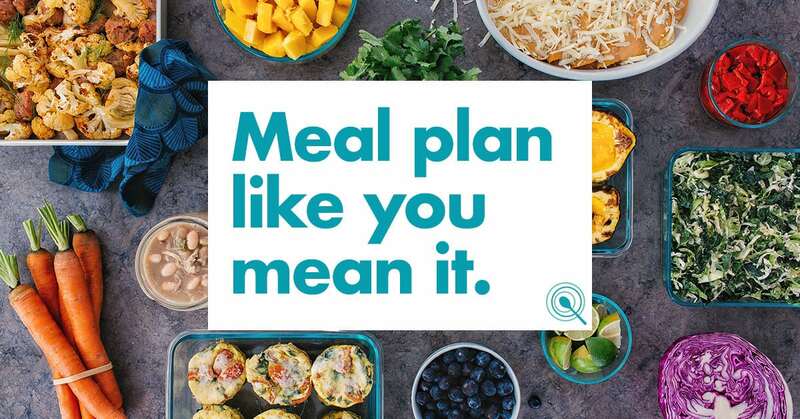 Not only will it save you valuable time and money, but it will help keep food temptations under control. It’s much easier to stay on track when you can quickly make a keto dessert option, rather than running all over town trying to locate the ingredients. Keto baking is not hard to do when you already have all your ingredients on hand. Personally, I like purchasing my baking items on Amazon. I find that their prices can’t be beaten. Trust me I have shopped around and not only are their prices great but the convenience of shopping online works fabulously for those with busy schedules. 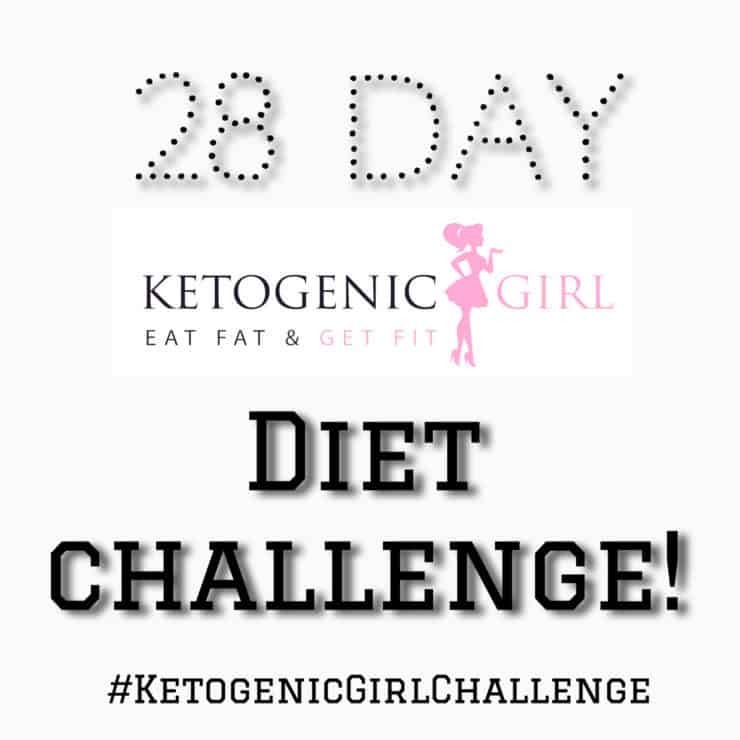 Have you wondered if chocolate is even a good idea on a low carb, keto diet? Well, let me reassure you that you can safely indulge. Because chocolate on its own is actually very good for you. AND as long as you mind the sugar, it’s relatively low in carbs. The problem isn’t the chocolate itself people, it’s all the sugar that usually comes with it. BUT once you swap the sugar for a sugar substitute like my favorite Swerve, you have nothing to be concerned about. 100% unsweetened cocoa powder isn’t high in carbs. You are looking at a net carb count between 8-20 per 100g, depending on the brand you choose. AND rich dark chocolate doesn’t require the use of large amounts to make a big flavor impact. A little unsweetened cocoa goes a long way, which makes a recipe like my keto no-bake chocolate strawberry cheesecake ok on a low carb keto diet. Most of my chocolate recipes have anywhere from 3-6g net carbs. So you can easily plan for a keto-friendly dessert. Wondering what other chocolate recipes I have? Check out my glorious low carb keto chocolate category. Yes, I’ve dedicated an entire category to all things chocolate. You’re welcome. Chocolate is processed from the seed of the cocoa tree and it’s actually one the best sources of antioxidants. Isn’t it fabulous that it also happens to be delicious? Because of the high concentration of antioxidants in chocolate, studies are showing that it can improve our health and even lower the risk of heart disease. Maybe that’s why chocolate is so loved during Valentines? It’s a heart thing! Consuming chocolate can even improve your mood and memory. BUT of course, this is only referring to chocolate that is not loaded with sugar. AND….keep in mind that the darker the better when it comes to chocolate’s health properties. My keto no-bake chocolate strawberry cheesecake recipe features a chocolate “Oreo” crust that is sure to make you swoon. Which is why I’m certain that this chocolate crust will find itself in more no-bake recipes in the future. So stay tuned. Currently, this low carb no-bake cheesecake is my new favorite. Of course, you should know I’ve been known to say this with just about every new keto treat I make. LOL, it’s so funny how attached I am to my recipes. I feel like a proud momma sending her kiddos off to discover the world each time I add a new one to the blog. AND…..when you all tag me on Instagram with your pictures, let’s just say it makes momma beam with pride. 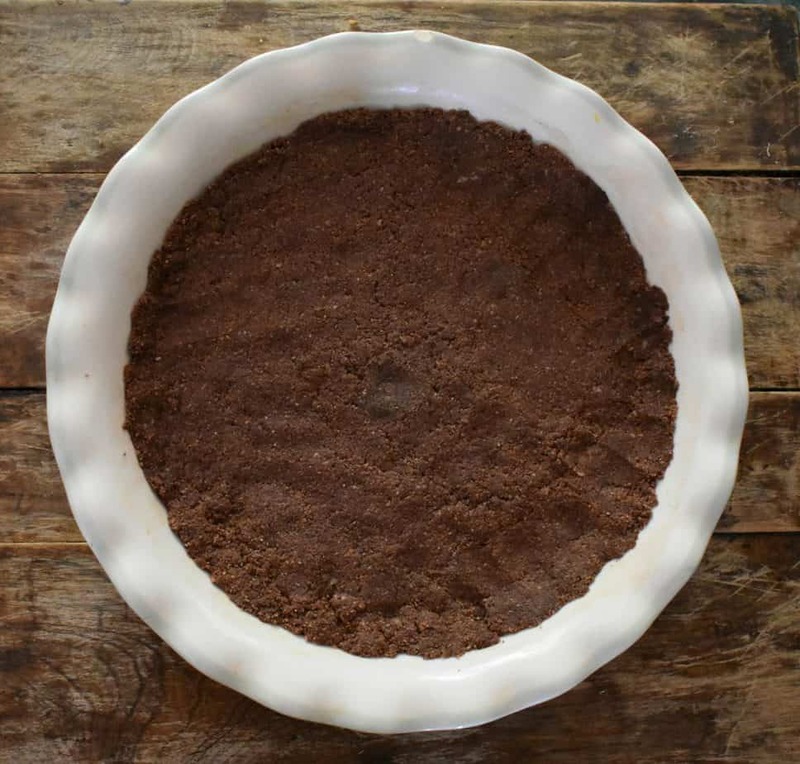 The chocolate “Oreo” crust is made simply by combining 1/4 cup of unsalted butter, 2 ounces of baking chocolate,2 cups of almond flour and 1/4 cup sugar substitute. Then once combined, you press the crust into a 9-inch pie plate. To make the chocolate cheesecake, mix 20 ounces of room temperature cream cheese, two cups of sour cream, three cups of sugar substitute, 1/4 cup of dark cocoa powder, 2 ounces of unsweetened baking chocolate that’s been melted in 1/4 cup of butter. Surprised by the addition of sour cream? Well, you shouldn’t be, because it goes perfectly in a cheesecake recipe. It’s what gives this no-bake keto cheesecake its luscious texture. You’re just going to have to trust me on this. I assure you that you will be pleasantly surprised. 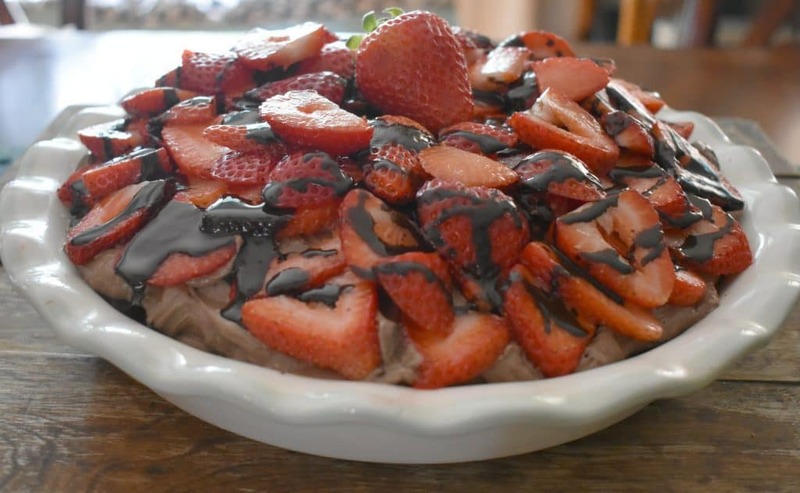 Note that you can reduce the sugar-substitute to taste and it will not affect the consistency of this keto no-bake chocolate strawberry cheesecake. The best part is that you can adjust easily as you mix. I opted for a sweeter version because I wanted to nail the true flavor of cheesecake and win over even those who don’t do the keto lifestyle. Guess what? My mission was accomplished. Yay me! 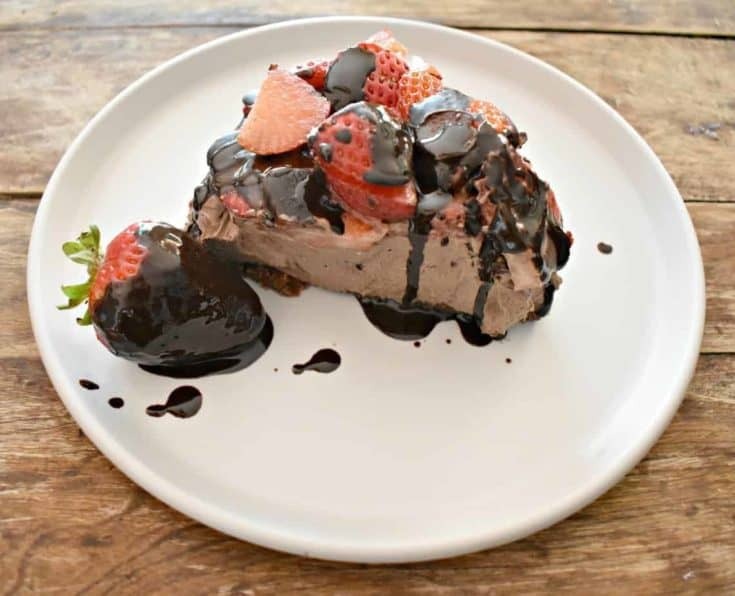 Finish off this keto no-bake chocolate cheesecake with sliced strawberries AND…. my fast and easy recipe for chocolate ganache. To make the low carb healthy chocolate ganache simply melt one ounce of 85% chocolate and 1 tablespoon of coconut oil for about 30 seconds in the microwave. There you have it! All you need to make this delicious keto no bake chocolate strawberry cheesecake. Make sure you remember to tag us on Instagram and Facebook with your pictures. I just LOVE seeing my little recipes recreated. It’s what keeps me encouraged to keep sharing and perfecting my recipes for you. Before I leave you, please allow me a chance to share my favorite keto tip to stay on track. The use of exogenous ketones. 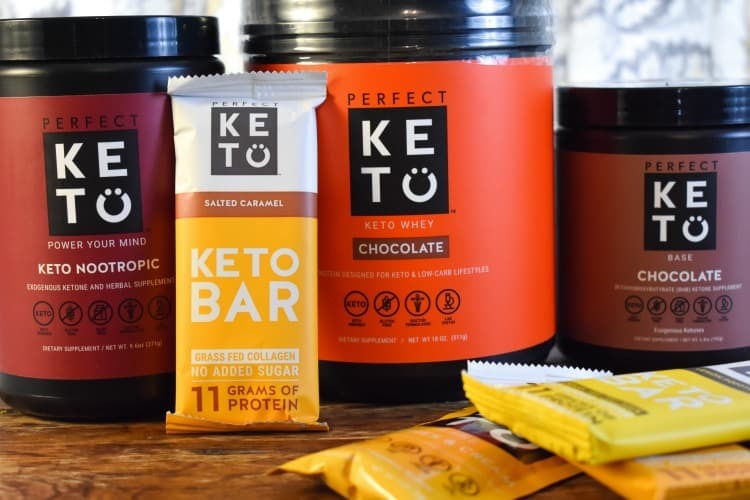 When it comes to exogenous ketones, not all are equal. The quality of BHB exogenous ketones really matters. But why take exogenous ketones if your liver can make them? Well, because when taken as a supplement they can really boost your blood ketone levels. 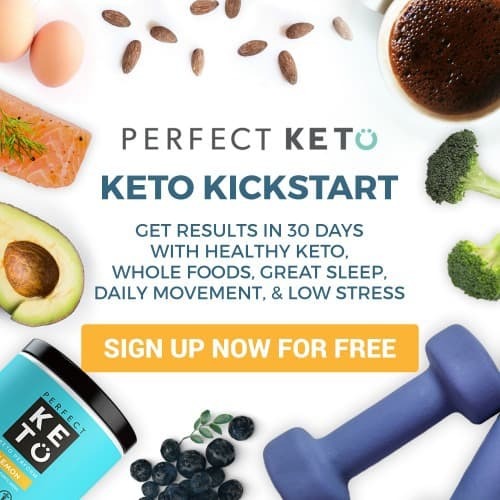 Plus it’s a fantastic tool for getting into ketosis quickly and priming your body to use fat for fuel when you are on the keto diet. 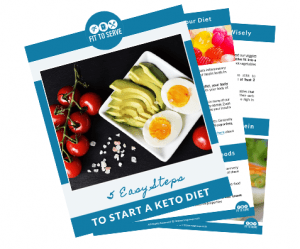 It’s especially great for those who are either starting a low carb keto diet or are struggling to stay committed to the lifestyle. It also serves to put you quickly back in the lane if you end up eating too many carbs. Rather than be completely derailed, you stop the bad carb cravings in their track. What we find is that when people cheat if they don’t have a tool to get them refocused, they can go down a very slippery path of continual cheating. 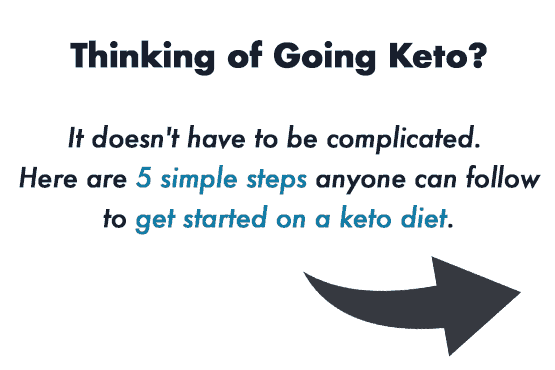 It’s the number one reason we endorse the use of exogenous ketones. Does this mean we are giving you a green light to cheat? Of course not. In our book, that would not be a responsible approach and in the end, can lead to poor eating habits. However, it does give you a little more freedom. So that if from time to time you want to enjoy a higher in carb meal you can do so safely. To this add the almond flour, sugar-substitute, sea-salt and combine well. Press the crust into a 9 inch pie crust and place in the fridge until ready to fill. Melt the butter and unsweetened baking chocolate and combine well. Using a mixer combine well the cream cheese, sour cream, cocoa powder, and sugar substitute. Then add the chocolate/butter mixture gradually to the cheesecake batter and mix till fully combined. Fill the chocolate crust with the chocolate cheesecake batter. Making sure to spread the mixture evenly. Add thinly sliced strawberries to the top of the cheesecake. Melt the coconut oil with the one ounce of 85% chocolate. Top the keto chocolate strawberry cheesecake by drizzling the chocolate ganache sauce over the top of the strawberries. Allow pie to chill for a minimum of 4 hours or overnight before slicing. Glad you enjoyed it pastor Yvette. Are you suppose to use granulated sugar in the cheesecake portion or icing sugar? Hi Helen, I used granulated. Did you find that it mixed well or was a bit grainy? It mixed well. I didn’t encounter any graininess. I used an electric beater to combine the ingredients. Hi Brenna, So thrilled you're going to make it Darling. Thanks for stopping by. would you put the strawberries on if you are letting it sit overnight? Hi Sue, Add the topping after when you are about to serve for best results.